Believe it or not, temperatures do actually drop below 32℉ in Baton Rouge. After all, we did get snow last year! 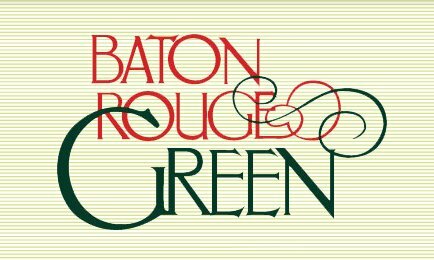 One of the most important things you can do to protect the trees that live on your commercial or residential property during the winter is to make sure they are mulched before Baton Rouge’s temperatures plunge. By having Bayou Tree Service mulch your trees, you’ll be protecting them from the freezing conditions they’re normally unfamiliar with. Trees that thrive in hot and humid climates like ours need extra freeze protection through mulching to make sure they survive the “shock” of our city’s drastic change in temperatures. 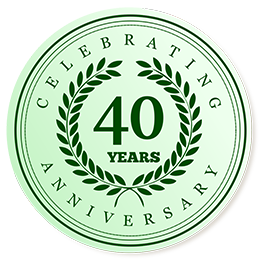 Among the many tree services we provide Baton Rouge property owners is mulching trees using our very own organic eco-mulch that we create ourselves. 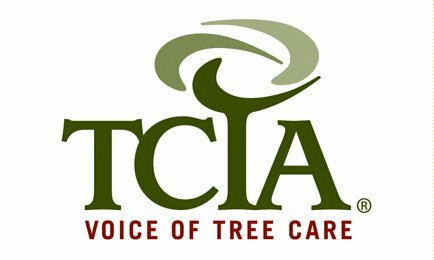 You can buy mulch in bulk from pretty much any tree service or gardener to protect your trees from freezing in the winter, but do you know what’s in that product? The eco-mulch we create is far superior to any mulch you might get from a large landscaping supplier. Traditional commercial mulches can be contaminated with organisms like fungus. Dyed mulches are usually made from recycled wood (like construction and demolition waste). This means some of these mulches may use treated wood, which can contaminate your soil. 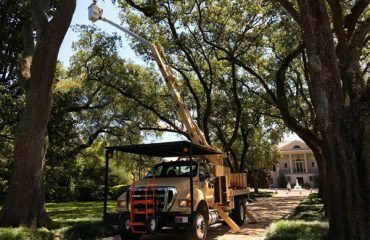 At Bayou Tree Service, our eco mulch is only created from the wood we remove from tree service jobs. It’s chipped, ground and aged then we grind it again to create a rich , natural mulch that’s already begun the decomposition process. Letting the mulch decompose creates heat leaving our mulch weed and seed free, and the microbes created help improve your soil. 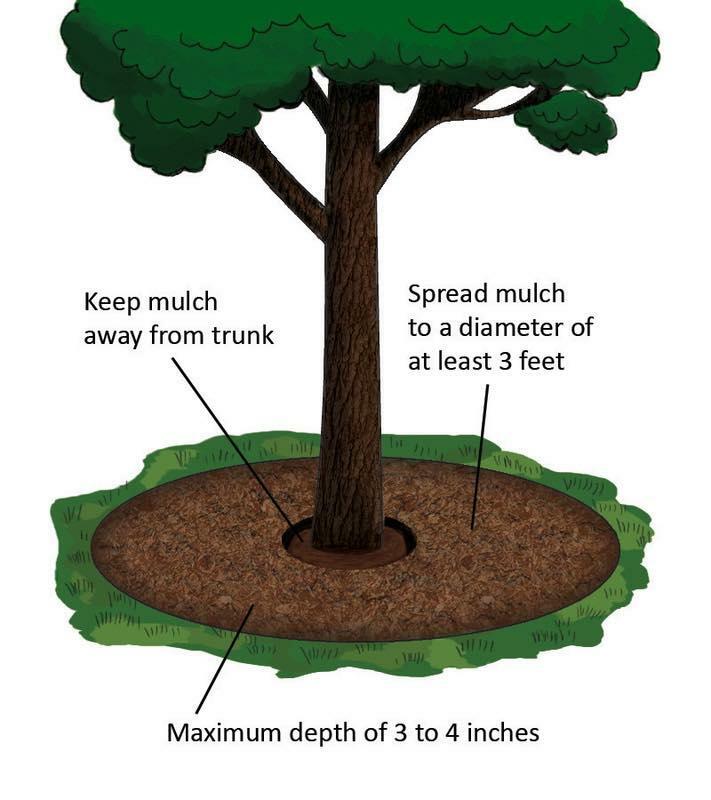 When you hire Bayou Tree Service to mulch your trees, you can rest assured that we will mulch them properly! Proper technique is important when mulching to ensure the health of your trees. Too much mulch is definitely a bad thing! 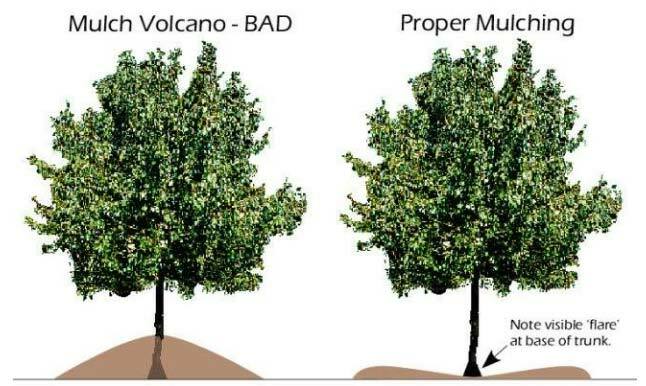 Volcano mulching is often seen but many people don’t know this actually stifles the base of the tree. Proper mulching allows the base of the tree to breathe, and prevents too much moisture building up around the base of the trunk and root flares. While leaves may fall and flowers fail to blossom during the Baton Rouge winter, it’s still important that you take care of your trees during our city’s coldest months. After all, you want that full green canopy and beautiful blossoms next spring, right? By mulching your trees during Baton Rouge’s winter months, you’ll be protecting them from the freezing conditions they’re normally unfamiliar with. Trees that thrive in hot and humid climates like ours need extra freeze protection through mulching to make sure they survive the “shock” of our city’s drastic change in temperatures. While you definitely want to protect those majestic historic live oaks on your property, newer trees need mulch protecting during Baton Rouge’s winter season, too. 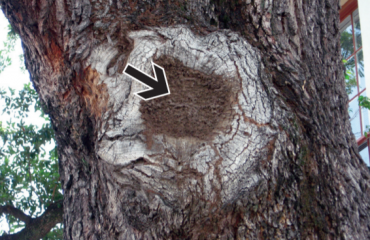 That’s because trees that have been recently planted lack the deep root system and mature bark of older trees. If we’ve planted trees for you this year or last, you definitely want to make sure they’re properly mulched this winter. 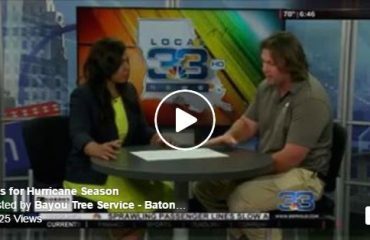 Even though the temperatures have already started to drop in Baton Rouge this season, it’s not too late to protect your trees. Call us today at (225) 401-0084 to learn more about how we can mulch and protect your trees this winter, and to get an estimate on our tree mulching services.